Family owned and operated, Whitfill Nursery has been serving the valley for over six decades. Visit any of our three Valley locations and you will appreciate the difference. Friendly, knowledgeable staff, quality inventory, and a neighborhood atmosphere are what set Whitfill apart from other plant nurseries. Whitfill employees average fifteen years experience with our company and are anxious to share their love of plants with new and seasoned gardeners. Whether it’s choosing the right annuals or a complete landscape design, the staff at Whitfills have all the answers. Quality inventory is what we are most proud of. Our shade, palm and citrus trees are raised here in the valley. Our plant nursery have over 300 acres of growing grounds where we produce great quality trees that transplant effortlessly. Whether it’s a 15 gallon tree or a 96” box tree, Whitfill has all your tree and nursery gardening needs. 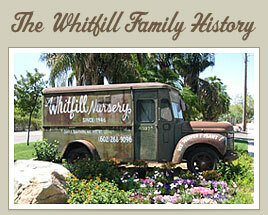 For over 60 years ,Whitfill Nursery has been serving valley neighborhoods. We consider it a privilege and are grateful to our long term customers. Worth the drive from anywhere, stop in any one of our garden nurseries and experience the difference.